Barnes & Noble calls the technology for its color touchscreen VividView. That means, obviously, that they feel the tablet offers a view that’s quite vivid, and in that they’re quite correct. There are a few other details worth noting: The screen employs something called in-plane switching (IPS). IPS is an improved version of the LCD that offers wider viewing angles and better color reproduction than earlier designs. The NOOK laminates the display to the surface of the touchscreen, which reduces reflection and glare. The touchscreen uses capacitive sensing, meaning that it detects the precise location of your touch as your finger disrupts the display’s electrostatic field. The Home button is marked with the NOOK symbol, which looks like this: Π. If your NOOK Tablet is sleeping — with its screen turned off to reduce battery use — the screen is also locked so that accidental touches don’t perform actions. Touch the Home button to wake up the device and turn on the screen. If the screen is already awake, touching the button takes you back to the Home screen. If you have told the system to require a password to start or reawaken, you will have to enter the four-digit secret code. Once you do that, the NOOK Tablet returns to the screen you were on before it went to dreamland. If you don’t make the NOOK Tablet require a password, you’ll need to give the reader a special little wake-up swipe. The sleeping device will display a white Π in a green circle near the lower-left corner of the screen. Press the green circle and drag it to the right to unlock the device and return to the last screen you were viewing. 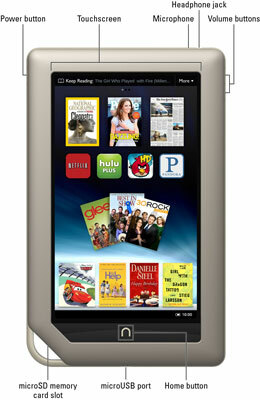 The NOOK Tablet, like its older cousin the NOOKcolor, has a cute little open notch in the lower-left corner. It looks for all the world like a place to hang something — perhaps a mountaineer’s carabiner. But please don’t. The designers who worked with Barnes & Noble wanted to make their reader immediately recognizable from across the room and this was the artistic element they came up with. However, don’t use the NOOK notch to hook the NOOK Tablet to your belt buckle (or to anything else). Although I’m sure some people will think it’s cute to attach a rabbit’s foot to the notch, don’t do it: You just might end up damaging the screen.